Our scanning feature is a solution developed to intelligently crawl and identify infections across any platform. The scanner leverages internal definitions that are refined daily, external sources, and intelligence to identify both potentially harmful signatures and anomalies that may not be known. Every plan includes a number of monitoring options, each of which provides a slew of information that helps to determine malicious activity. On by default for all clients, this option leverages our scanning service to identify all types of malware, SPAM injections, website errors, disabled sites, database connection issues and code anomalies that require special attention. Whois is an internet directory that provides information on who owns a domain. It is regulated and monitored by the Internet Corporation for Assigned Names and Numbers (ICANN) which is responsible for registration of all domains. This record contains information about the Registrant (the person who owns the domain), the Registrar (the entity that registered the domain), the dates, nameservers and other similar, and important, information. If at any time the information changes you will be notified. DNS is a protocol used by all computers to intelligently communicate with each other, it’s part of the TCP/IP protocol suite. Its specific function is to turn a website’s name (somesite.com, for example) into an internet protocol (IP) address like 123.45.567.891. The name provided by DNS is what we use as humans to read the site name, the IP is what the computers use to communicate. This monitoring option will monitor the IP address and associated DNS information of your domain for any changes. It’s rare for it to change, but if it does we will notify you. If you are using Secure Socket Layer (SSL), a secure protocol to transmit over HTTP securely, you are most likely using a SSL certificate. The SSL certificate is returned to a visitor of your site upon HTTPS request. This certificate often contains your site information and, in some instances, company information. If using a SSL certificate this option allows you to ensure it doesn’t change unexpectedly, if it does a notification will be sent. This option is best used with static pages as it can generate a high volume of email notifications. This monitoring option has to be configured separately and will traverse all files on the server. 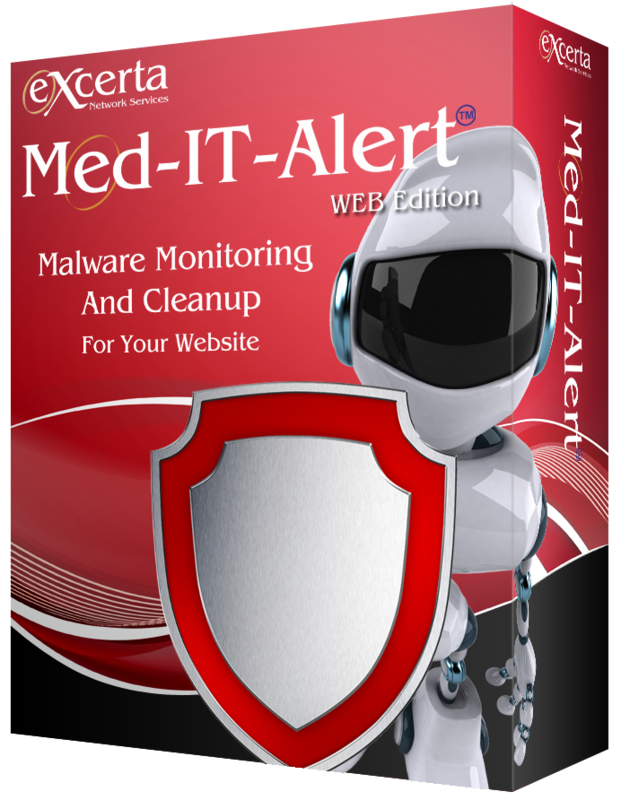 It’s designed to look for all malware types and includes a more robust detection mechanism for backdoors. The feature was designed to compliment existing scanning capabilities, improving accuracy and site reputations. We're so confident that the Med-IT-Aid WEB Edition tool will stop threats in their tracks that if in the highly unlikely event it doesn't, our technicians will carry out full remediation at our cost for the length of your contract. Now that's what we call a pretty impressive guarantee.